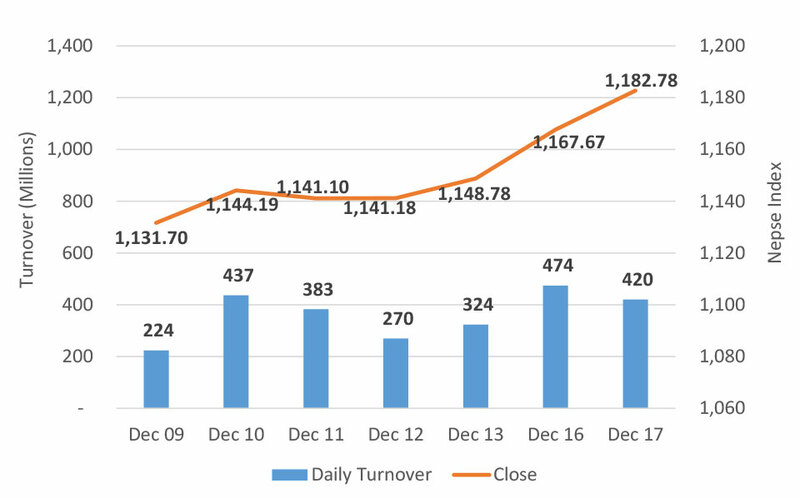 KATHMANDU, Dec 18: Despite lackluster activity in the early trading hour on Monday, stocks gained significant momentum toward the close. The benchmark Nepal Stock Exchange (Nepse) index traded along the unchanged line of around 1,167 points till mid-session. However, a late afternoon surge saw the index post a decent gain of over 15 points to close the day at 1,182.78 points. The secondary market stretched its winning run to fourth straight day as the overall sentiment saw a significant improvement after dropping to the 1,120-point level early in December. Following the upbeat movement of the index, the bourse posted an above average turnover of over Rs 42 million. The broad rally on the day can be attributed to gains coming from all traded sectors except the Trading sub-group. Non-life Insurance stocks registered substantial move to the upside as reflected by a 4.2 percent surge in the segment's sub-index. Life Insurance stocks also turned in some of the best performances of the day with its sub-index posting a gain of 3.71 percent. Meanwhile, Microfinance sub-index jumped 3.71 percent. Besides, Manufacturing & Processing and Banking sub-indices also closed in the green with advances of 1.05 percent and 0.88 percent, respectively. Among active stocks, Chhimek Laghubitta Bikas Bank Ltd posted the highest turnover of over Rs 48 million. Similarly, more than Rs 44 million worth of shares of Nepal Bank Ltd were traded on Monday. Furthermore, Global IME Bank Ltd Promoter Share and NMB Bank Ltd logged in total transactions of over Rs 35 million and Rs 30 million, respectively. NIC Asia Bank Ltd, Nepal Investment Bank Ltd and Nabil Bank Promoter Share were among other active stocks of the day. Microfinance stocks continued to lead the list of advances. Share prices of Mirmire Laghubitta Bittiya Sanstha Ltd and Kalika Laghubitta Bittiya Sanstha rallied by almost 10 percent each. Similarly, share price of Purnima Bikas Bank Ltd surged by 9.80 percent. Arambha Microfinance Bittiya Sanstha Ltd also posted significant move to the upper side. The micro financial institution saw its share price jump by 9.21 percent. Surya Life Insurance Company Ltd, Mahuli Samudayik Laghubitta Bittiya Sanstha Ltd and Summit Micro Finance Development Bank Ltd followed suit, posting gains of around 8 percent each. On the losing front, Kalika Power Company Ltd's stocks suffered the most as its share price slumped by 3.74 percent. Similarly, mutual fund units of Global IME Sammunat Scheme–1 shed 3.57 percent. Besides, Swadeshi Laghubitta Bittiya Sanstha Ltd, Rastriya Beema Company Ltd Promoter Share and Arun Kabeli Power Ltd followed suit and tumbled by over 3 percent each. On the announcement front, NMB Bank Ltd and NB Bank Ltd are holding their respective Annual General Meetings (AGMs) on January 10. While NMB Bank Ltd has proposed 10 percent bonus shares and 20 percent cash dividend, the latter has declared a 10.53 percent cash payout to its shareholders. ARKS technical analysis indicates the market forming a bullish candlestick for a fourth day in a row. Following the surge, the index has now breached its immediate resistance zone at around 1,170-point mark. Further, overall momentum seems to favor the bulls at present as reflected by a positive shift in technical indicators. The equity market's ability to hold ground above 1,170 points might see the index reach the psychological support level of 1,200 points.